A little while back, the Geological Society of London Blog posted about the best volcanoes for evil scientist lairs. Erik Klemetti didn’t like the top 5 choices, and decided to reveal his own: Mount Erebus. I have to admit, having evil (penguin) minions and an isolated location is pretty good for a mad scientist. And lava lakes are cool (and hot). But if I’m going to be spending all my time in my evil scientist lair, the climate had darn well better be warm, because I spend enough of my time dealing with below-freezing temperatures here in Buffalo. No Antarctica for me! No one lives there – there are two pesky stratovolcanoes which apparently make it unattractive real estate. But, when the people left, they also left behind buildings, WWII bunkers, and an air strip. All I need to do is plop some well-camouflaged facilities in the crater of South Pagan (North Pagan has a tendency to erupt), sink a few geothermal wells and set up my cabana on the beach. Even if the US Navy does drop in (they’re the only ones who seem to get out there anymore), I’m sure I can arrange with my Navy connections to have anything unusual “overlooked”. North Pagan has explosive eruptions. If I’m testing a doomsday weapon, what better way to hide it than disguising it as an eruption plume? This might prove to be tricky for a death ray, but I’m sure it could be passed off as volcanic lighting. Since the people who evacuated from Pagan had to leave their animals behind, there are now feral cows, goats, and pigs roaming the island. Ever tried to stare down a cow? Or been charged by a pig? Penguins have pretty snappy uniforms, but a cow makes for a slightly more threatening minion. Plus, goats make good lawnmowers. Would you want to face this down? Three words: Commercial grade pozzolan. 65 million metric tons of it. I won’t even need to rob anyone to fund my super evil activities. Financial independence, that’s key. It will not be necessary to wear multiple layers of clothing over my evil geologist gear. Can't do this in Antarctica! Once is a tryout, twice is a repeat, and three times is a meme – so I’m issuing the challenge. What’s your evil geologist volcano lair of choice? 1. Its what one would expect, being both a volcano and being on earth, its the first place I’d look for an evil scientist, its too close to the do gooders and easy to identify. 2. Earthly volcanoes are too active for establishment of future generations of your evil domain, always think about the future! Honestly I’d go with deep within Olympous Mons. If the lair is deep enough oxygen and carbon dioxide would be in a stable gasous form year round at the pressures, the gravity would be more comfortable, as well as increased temperature as a result of the pressure. As for your minions, if you want to say there are no martians, okay, cloning is always a good option and an army of prairie dog clones tunneling throughout Olympous Mons would certainly be a good security measure. Prairie dogs are best because they not only are rodents making them formitable minions due to being agressive and having teeth but they also tunnel and have an alert system for when someone is too close to the lair. Besides, don’t you love prairie dogs, their adorable, and nothing is better than taking down your enemies with something seemingly cute and cuddley. Financially, no matter what mars has for resourses, there is almost certainly plenty of it that is also untouched. Large amounts of slow cooled magma deep within the planet would surely be all one needed to establish your domain. Other advantages: invaders would have to cope with gruelling sandstorms and rough martian winters, playing hell with their electronic and mechanical devises. Though my love of the red planet may make me bias. Thanks for this great post (especially, since I just watched Despicable Me). And David: If you plan to rule the world from Mars, this will result in a galactic At&T-invoice for sending out your evil messages. 1. The food is great in Italy, so I can foster my evil geologists torso. 2. It is a submarine environment – and have you ever seen more scary critters than the ones living in our oceans? Great minions (not as good as the yellow minions from Gur, but better than cows for sure). 3. When last erupted in 1831, Ferdinandea already nearly started a major war between Italy, France, the UK and most parts of the Mediterranean costal sovereigns. Ferdinandea rose above sea level, thus leading to territorial disputes. But prior to the first shot, Ferdinandea disappeared beneath the waves again in early 1832. Hence, Ferdinandea is the natural source for evil forces. 4. I already installed my evil geologists lair on Ferdinandea, thus leading to an uprise of the island in 2006. Fortunate for my conquer-the-world-plans, the island stayed undetected. It remained 6 meters below sea level – still concealing the super-villain facilities and high-tech laboratory. 5. This is the official version of an incident in 1986: US warplanes bombed Ferdinandea because they mistook the shoal for a Libyan submarine. And this is what happened in reality: Yes, we tested the first doomsday high-tech lights-flickering weapon – the tectonic-speed-up convector to increase the velocity of plate-movement. 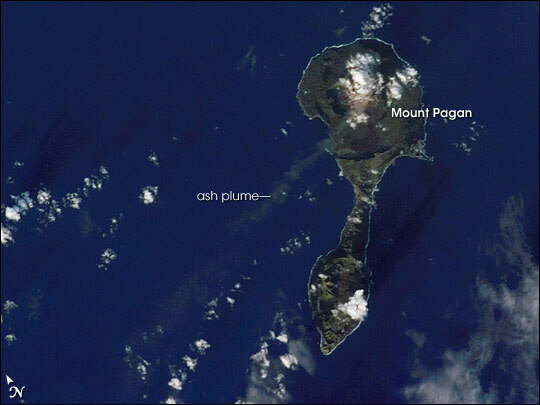 But how is Pagan a stratovolcano rather than a basaltic volcano? It can be both! It’s common to think of basaltic volcanism producing islands like Hawaii, or shield volcanoes, but a stratovolcano can be composed of many different types of lava, including basaltic lava. Basaltic is a compositional term – stratovolcano describes a particular shape and (presumably) internal structure. Ok, should have said, “shield” volcano. Stratos are usually associated with andesite, whereas shields are more ususally associated with basalt – reflecting their island status as compared to andesitic, that are more usually associated with subduction zones. So, the question should be more – is it an andesitic volcano? if so, what conditions prevail to produce the andesite in an island setting? Now we’re talking! You’re correct that andesitic volcanoes are more often associated with subduction zones, but one thing to remember is that subduction zones aren’t always on land – a great example is the Antilles Volcanic Arc, an island arc where volcanoes like Soufriere Hills have andesitic and basaltic andesite magmas. The andesite composition has to do with the amount of time a magma has to crystallize certain minerals (fractional crystallization), and how much crustal material it assimilates; a basaltic magma represents a composition closer to what we see in the mantle, while an andesite has either been stored somewhere below the volcano long enough to ‘evolve’ or has incorporated something more silicic from the crust (or both). There’s a paper by Marske et al. (2011), Geochemistry of southern Pagan Island lavas, Mariana arc, which goes into detail about the geochemistry of the magma at Pagan (http://www.jamstec.go.jp/ud2012/pdf/Garcia,_Michael.pdf); the basics of the situation at Pagan is that the volcanoes there are both basaltic stratovolcanoes, with magmas that have only undergone a small amount of fractional crystallization and magma mixing before being erupted. In Pagan’s case, these magmas are thought to have formed when water from the subducting slab helped lower the melting temperature of material in the overriding ‘mantle wedge’, and the resulting magma erupted without being stored long enough under the arc to differentiate into something more silicic, like andesite. Silly me, its sitting right on top of the evil Japanese trench. Possibly one of the most complicated areas of tectonic plates on the planet. Good converstaion, Jessica.